Washington state is in the middle of a frightening measles outbreak: There are currently at least 55 confirmed cases in the state, according to a report from the Washington Post published Thursday. Almost all of them, so far, have been in Clark County, where public health officials have reported 50 confirmed cases and 11 suspected ones and where nearly one in four kids attend school without having received their measles, mumps, and rubella vaccine. Measles is “exquisitely contagious,” the head of Clark County Public Health told the Post, and can spread “like a wildfire” in under-vaccinated communities. The outbreak in Clark County has meant that parents with newborn babies—like Amber Gorrow, whose eight-week-old son is too young to receive the measles shot—are reconsidering basic things like going outside, running errands, and letting their children have playdates. Anti-vaxx pseudoscience been repeatedly discredited, retracted, and called an “elaborate fraud”—but the anti-vaxx movement lives on. Broadly speaking, as the Post points out, anti-vaxxers believe that the risk of catching a disease like measles—which Americans incorrectly think of as living in the past—is less than the risk associated getting the MMR vaccine. 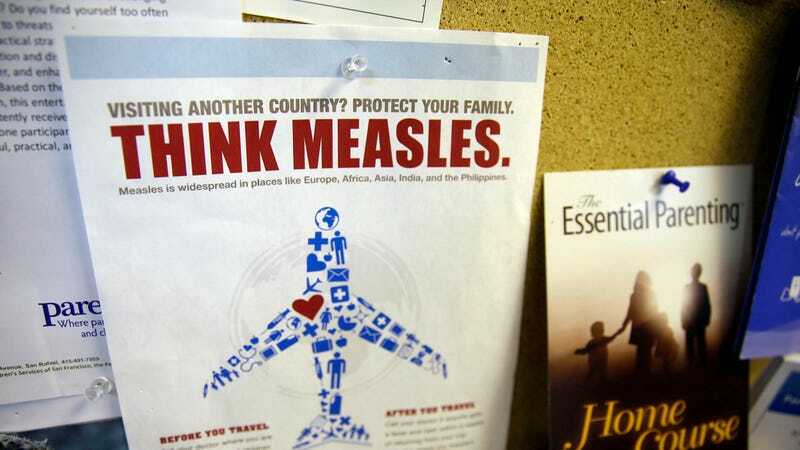 The irony is, of course, that measles was considered eliminated in the U.S. some 20 years ago because of the widespread use of vaccines. The boy who has not had the Vitamin K shot is warm, swaddled, breathing quietly. His heartbeat is regular and his normal newborn’s heart murmur has faded. He is holy; he is perfect. And it is shocking to realize the narrative place my medicines hold in this mother’s cosmos. To her, my shot and I are pollutants. We are the bitter Samaritans, strewing bones through the temple in Jerusalem. As Pearson writes, that mother left without allowing her child to get the shot.